You can tell a lot about a person by the way she/he responds to pain. You can deny the pain exists. You can drown it in other distractions. or you can announce it to the world for them to cheer you on. or curse what you've been dealt and feel driven by anger. and dive and drown in it all over again, as if in search of something. I write verses with it. Beautiful, Joy. And I hope everything's okay! Thank you for your thoughts, Lana. 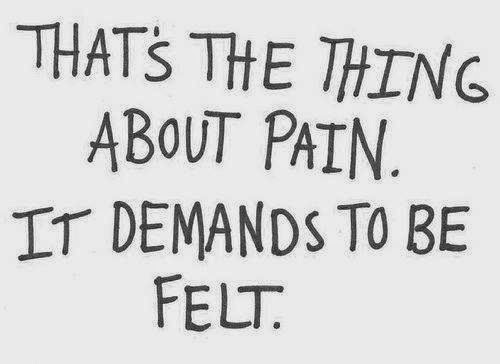 Yep, the pain's got to go somewhere, all right. I appreciate how you've put this into honest, lovely words. Yes. You can't ignore pain. Psychic pain usually ends up in the body, screaming to get out. It's good to get it out onto the page before that happens. I loved this but wondering if you are doing okay? Physical pain is one thing, then I'm a whiner. Psychic pain is the other,then I'm a digger and excavator. Very interesting post, I liked it but I wouldn't want to feel it.